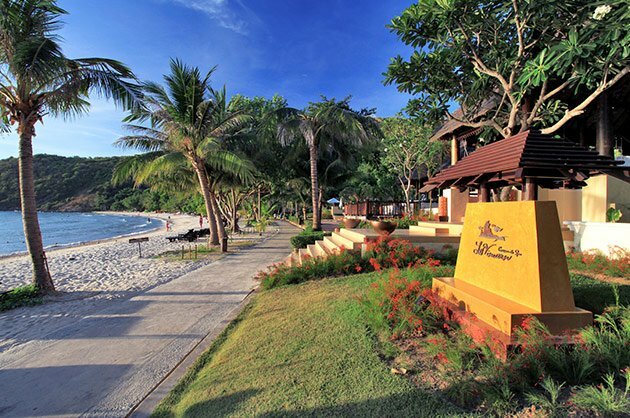 Putahracsa Hua Hin allows guests to combine the charms of small town leisure together with a beach hideaway. Situated in the residential section of Hua Hin, Putahracsa is designed to feel like a beach residence. All rooms and villas reflect the owners’ personal touch, incorporating Hua Hin’s tradition and blending it with contemporary design. Each detail is crafted by interior designer, Viboon Techakalayatum, my husband and owner of Design Scene Co., Ltd. The resort is managed by The Unique Collection of Hotels & Resorts, whose team ensures that guests receive the highest level of service. 44sqm Located around the main pool, Silksand Rooms are designed based on balancing the different elements of nature to create a unique mood & experience. Either King or twin bedded, all rooms feature basic luxury amenities, a relaxing bathtub or large opened shower along with complimentary Wifi connection. Spacious and comfortable, ground floor rooms are located in between a large terrace whilst upper floor rooms offer panoramic views of the pool. Located on the upper floors, 8 Silksand Deluxe rooms are Putahracsa’s newest room category, having been introduced in December 2014. Each unit features tiled mosaic floors, walk-in closets, a King size bed, a day-bed which can also serve as an extra bed, walk in shower with Jacuzzi streams, and a private balcony with a sitting bench overlooking the swimming pool. Drawing inspiration from the flowing winds of Hua Hin, 16 semi-detached Silksand Deluxe and Sansky Rooms surround an exclusive swimming pool offering guests a private haven within Putahraca’s vibrant and lush grounds. Located on the ground floor, 8 Sansky Rooms offer King size beds with a separate living room and sleeping area, separate rain shower and bathtub, and an outdoor terrace with sun lounger where guests can be ensured of an intimate & peaceful sojourn in Hua Hin. 80sqm Oceanbed Jacuzzi Villas are locate on the upper floors and 1 on a lower floor with a private terrace. The villas feature a large bedroom with a King sized bed, indoor and outdoor seating areas, individual rain shower cabins and an outdoor Jacuzzi (110cm x 180cm).